I think this is one of Jes' best posts! The handy Character building worksheet that she created will really help you to dive in and discover traits about the character you are playing that will bring new layers to the surface that you might have never found otherwise! I'd like to add one little tip (that Jes hints at) and suggest that you fill out the worksheet for yourself first. As in… answer all the questions honestly about yourself in first person before you answer them about your character in first person. Once you see how detailed you are in answering the questions for yourself, it will be easier to answer them for your character. AND, as Stanislavski says, “Start with one's self.” We can't be expected to play another person if we don't know who we are. Recently I’ve been spending more time learning how to create a character. I’ve read books on the topic and worked on this in classes, which is a great start, but I’ve realized I really need to dig in deep to create one. It’s so much fun to be the hilarious clown, the popular kid, the wicked stepmother, or the dramatic prima donna, but it takes LOTS OF WORK behind the scenes. One tool that I like to use is a character analysis sheet that I have created for myself. It helps me think more deeply about who my character is and why she dresses, moves, and talks the way she does. Who she is and how she acts comes from WAY more than just lines on the script. She is a person who has thoughts and feelings, even if they are never acted out on the stage. A great way to start is to start is by analyzing yourself, in order to get to all your funny quirks. Another thing I like to do is watch people to get ideas. People can do some silly, crazy stuff that makes for a great character. I try to keep ideas I see locked in my mind-palace for future characters. I confess to you that I am not an expert at creating a character. And I know many of you reading this have LOTS of experience, and I would REALLY like your help! How do you create your characters? Do you have any special tools that you use? What do YOU do? Let me know in the comment section below. 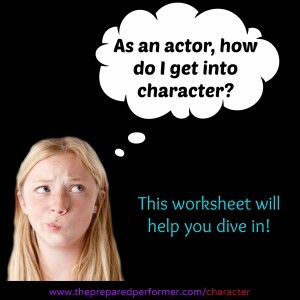 Incase you missed it… here's the link for the character analysis sheet. -A kid who likes to shimmer, shine, sparkle and glimmer!